Once again it was -50F in the valley. I think we hit a high of -35. Only two days of this, and everyone was crabby. Unfortunately, I was in a really good mood all day, and that just seemed to piss people off. Oddly enough, that just made me more bubbly. I had to make a run into town to pick up some fuel de-icer for a client whose oil stove was acting up. He was one of the crabby ones today, even though I figured it was something simple like water in the fuel line. In town, I saw a guy on a motorcycle with a side car come out of the ice fog at a light. I knew I had far too many layers on to try to get my phone out to take a picture before the light turned. After picking up the de-icer, I saw the guy ahead of me on Farmer’s Loop. 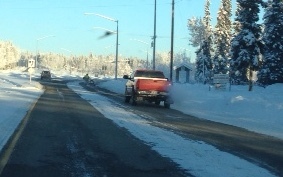 I took a quick picture, but it’s kind of hard to make out the crazy guy on the bike, but he’s ahead of the red pickup. Taking a photo in -50 degree temps is not as easy as it looks. This entry was posted on Tuesday, January 27th, 2015 at 3:06 AM	and tagged with cold, Fairbanks, ice, J.O.B., photo, snow and posted in Alaska. You can follow any responses to this entry through the RSS 2.0 feed.